This soup was a concept that kept changing. First I thought I’d make lentil soup with sausage and kale. But we were out of lentils, and I thought white beans would be even better. 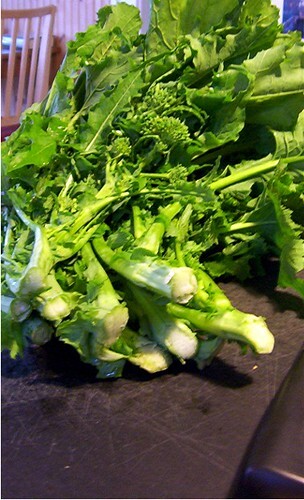 Then when we went to Dunbar Gardens to buy vegetables, there wasn’t any kale -so we got broccoli rabe instead. As it turns out, there’s a recipe for this exact soup in Barbara Kafka’s Soup cookbook. I glanced at her approach, then built the soup my usual way. I started a pan of small white beans simmering in water and chicken stock with a clove of garlic, and left it alone for a while. When the beans began to soften, I worked on the other components. I put three hot Italian sausages in a covered skillet with a bit of water and let them steam, then uncovered the pan and browned them a bit for flavor. I set them aside to cool. In the soup pot I sauteed some diced carrot and a head of sliced garlic in a goodly amount of olive oil. Once they started to brown a little I added the entire bunch of broccoli rabe, chopped fairly fine. I got it all coated with the garlicky oil, salted and cooked down a little, then added a bunch of the broth from the beans and some more water, covered the pan and let the rabe simmer for a bit. Then I dumped in the beans and remaining broth, sliced the sausage and added that in, gave it a good grinding of pepper and decided it was done. It went into the fridge to meld until dinnertime – bean soups are always better with time to sit, so I usually make them in the morning. It was tasty, the bitterness of the rabe nicely offset by the richness of the garlic, sausage and beans. Bread and butter would have gone well with it, too, if I’d had any. No pictures of the soup because the camera battery died, sigh.